In 1939, Stalin ordered Azerbaijan and all nations of Turkic-related languages to adopt Cyrillic as their standard alphabet. At the time, Azerbaijan was using a modified Latin script, which they had officially adopted a few years earlier in 1923 after centuries of using the Arabic script. Stalin was concerned that the Latin alphabet could become a unifying force for the Muslim Turkic nations. As his decision was imposed during the height of Stalinist Repression when tens of thousands of ordinary citizens were being arrested, shot or sent to Siberian labor camp, no one dared protest his ultimatum. But a few intellectuals in Azerbaijan did try to divert attention from the alphabet to the Azeri language itself, hoping that no matter what set of symbols was dictated, that the language itself would survive intact. They were especially concerned that introducing Russian letters that were irrelevant to the Azeri sound system would eventually result in changes to the inherent nature of Azeri itself. Nevertheless, four characters were introduced and there was no way to get them officially removed until 1958 - five years after Stalin died. Here, some of Azerbaijan's intellectuals urge caution in regard to anything that might lead to structural changes to the language itself. The person who does not know his own mother tongue well will not be able to master other languages either. The fate of our language cannot be sealed by a few individuals. The greatest protectorate of our language is the people themselves, the speech and history of the nation. Let not publishers and printers rush out to create a great single Communist language of the future. As the saying goes: "Let them not roll up their sleeves before crossing the river. Let them not feel the warmth before the arrival of summer." Let them not litter our language with their ignorance. Let me remind you of an Azerbaijani expression: "Sit down and be more heavy" (Be more serious and don't talk nonsense). Rasul Reza, President of the Azerbaijan Writers' Union, addressing a session of the Supreme Soviet of Azerbaijan SSR in 1939. Soon afterwards he lost his job and was sent off to fight in World War II. Fortunately, Reza survived, unlike nearly 400,000 other Azerbaijanis who died. In what language do you want me to pray to you? Is one prayer enough for you? Or shall I implore you several times for a favor? I'm laughing neither at you nor the world. Of the thousands of languages that you have created. Is known neither in heaven nor on earth. (Gospodi, pomogi, Gospodi - in Russian). Or on what path you lose your way? 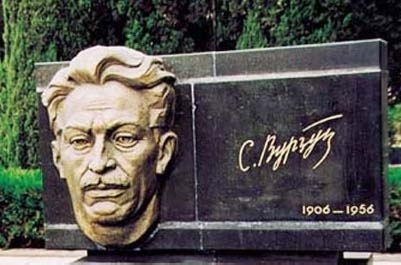 Mirza Ibrahimov, People's Writer of Azerbaijan, served as Chairman of the Supreme Soviet in Azerbaijan in 1954. He felt very strongly about that nothing was more natural than the desire of a nation to conduct its official work in its native language. He believed such was the legal right of every nation in the Soviet Union and that everyone had to respect this right. With incredible effort, he eventually succeeded in getting Azeri recognized as a State language. At the time, not everyone in Azerbaijan knew Azeri which resulted in a lot of confusion, delay and miscommunication. Often telegrams written in Azeri wouldn't reach their intended recipients, mail from villages would be returned, and government applications would be processed incorrectly, or not at all. Ibrahimov pushed hard to make Azerbaijan a second official language, in addition to Russian. He went to Moscow to speak to the Chairman of the USSR Supreme Soviet, who agreed with him, convinced that the idea made sense. In 1956, the Azerbaijan Communist Party Central Committee amended Azerbaijan's Constitution to include: (1) Azerbaijani is the State language of the Azerbaijan Republic, and (2) National minorities living in Azerbaijan shall be guaranteed the right to develop independently and use their national language in their cultural as well as state organizations. Some approved; most didn't and local authorities were not prepared to enforce the law. After all, people had just lived through the Stalinist era. Khrushchev had just come to power. It wasn't long before Ibrahimov was removed from his position. Family members insist it was because of his persistent position about the Azeri language. In 1957 Ibrahimov went on to publish the book "The Azerbaijani Language" that set forth his ideas. In 1959, at a plenary session of the Central Committee of the Azerbaijan Communist Party, Ibrahimov blasted the Republic's leadership for not implementing the new law about the Azeri language. A bitter debate ensued. Ibrahimov was criticized for trying to weaken the people's desire to learn Russian. Others said that adopting a law wouldn't change anything. Someone even suggested that Ibrahimov should be sent to a village to "learn the peasant life." One of the most controversial sections of his book stated that "language is not only created by writers and journalists but by the entire nation. Therefore, the entire nation should know it, especially scholars, university teachers, top authorities, Party and Soviet leaders. Not only should they know it but they should know it well. Not only is it their duty as a citizen, but it is their responsibility which arises from their position." Ibrahimov concluded that there were enormous gaps between life as it was and life as it should be. Ibrahimov's point was eventually proven. In 1995, Azerbaijan's new Constitution as an independent State designated Azeri as the only official State language. Slowly, a perceptible shift in attitudes toward the Azeri language is taking place. Gradually, Azeri is gaining the status that Ibrahimov dreamed of nearly half a century ago. Much of the information for this article was taken from the article "After 30 Years," written by Alexandre Grich in 1986. 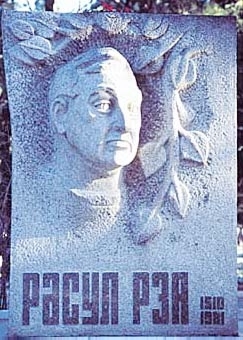 Samad Vurghun was reverred as one of Azerbaijan's most beloved poets. Despite how much he did not want to adopt for the Cyrillic alphabet, he had no choice but to embrace the concept and to persuade others to do the same. Notice how he advocates for the integrity of the Azeri language despite the restrictions that Soviets were imposing via the Cyrillic alphabet . The issue that we have gathered to discuss today is a very serious and complicated one. As such, it is necessary that we follow the advice of linguists and professors. Nevertheless, I would like to express my own opinion. You well know that the old Arabic alphabet stood like a stone wall in front of the beautiful and cultural language of the Azerbaijani people for many long years. By banning the use of this alphabet, the Azerbaijani people made a great stride forward in its history. Some of the other nations of the Soviet Union went on to follow our example. But today as we are talking about creating a new alphabet, some of our friends don't understand the real issues, and they explain this by saying that the modern Azerbaijani alphabet is reactionary. This is not right. The reason why we are converting to a new alphabet is not because the Latin script is bad, it's because the Russian alphabet is more productive and better. Azerbaijani people are proud of being the first among Oriental nations that buried the Arabic alphabet and adopted the Latin alphabet. This event is written in golden letters of our history. We say: "Comrade Latin Alphabet, we are your friends. You came to our house like a new moon, but now the sun with its powerful rays has come to our house. So, don't be offended by us." At least, that's my opinion. After the October Revolution, Cyrillic which was the alphabet of the most progressive and advanced nation became the alphabet of a number of Soviet nations. And that's why Azerbaijanis now consider it necessary to accept a new alphabet based on that script. But in order that the Azerbaijani people can benefit from it, this new alphabet must both reflect the subtlety, beauty and national traits of the Azerbaijani language and must further stimulate its future progress and development. There is no need to say how rich and cultural our language is. We know that Azerbaijani language stands on the level together with the languages of advanced countries of the world. It is a language whose written literature has a millennium of history. And that's why we must try to build up our alphabet as an advanced and cultural alphabet. What are the prerequisites necessary for a new alphabet to advance? I think that the first prerequisite is to reduce the number of symbols as much as possible. If we can maintain 32 letters in our new alphabet, if we can meet the demands of our language with these, then it can be considered that we have accomplished our duty with honor. I think we have to be very greedy about the number of letters. This is not the greediness of Haji Gara [a character in one of Akhundov's plays]. This is for the sake of our language alone. From this point of view I want to say a few words about the Cyrcillic letters [which represent the sounds] ts, yu, ya, soft sh, soft sign and hard sign. These letters cannot be included into Azerbaijan's alphabet simply because they have no corresponding sounds in our language. We have to protect the musical characteristics and harmony of our language. The point is not whether to include "ts" in our alphabet or not, the point is that Azerbaijani language has its own national traits. Including such letters in our alphabet can somewhat alter the harmony of our language though they sound good and beautiful in the Russian language. Some friends support the idea of adopting certain letters simply for the sake of foreign words in our language. But history shows that as each nation derives words from foreign languages, it subordinates them to its own phonetic sound system. It surprises me greatly that some people demand to bring the "soft sign" into our language. I don't think it is necessary to do that. Because there is no such sound inherent to the Azerbaijani language. The soft ending of words in our language is not determined by the last letter of the word, but rather by the letter that precedes the last one so there is no need to use this letter that represents the "soft sign". The second necessary prerequisite for our alphabet is to guard it from "dots and tails". This was one of the disadvantages of the Arabic alphabet. Fuzuli wrote with such great skill of the agony brought on by a forgetful and careless secretary who forgot to put in all the "dots and tails". And for this reason alone, we must protect ourselves from "dots and tails" forever. . . . There are letters in our alphabet like "h, , , and ," which need to be preserved either by keeping the letters of the current Azerbaijani alphabet or by creating new signs that can fully correspond with the colorfulness and richness of our language. These letters don't need to be replaced by Cyrillic or distorted. The creation of a new Azerbaijani alphabet on the basis of the Cyrillic script will create a bridge for our nation to learn Russian and also for other brother nations to learn the Azerbaijani language. The political and cultural significance of this task exists in this fact. So, we must begin this work emulating the Bolshevik pattern of courage and creation. Only in this way can we create a scientifically based, rich and cultural alphabet for the Azerbaijani nation.